A great way to improve your guitar skills - and not just for beginners. An ideal tool for building the ability and confidence of learning guitarists that's great fun for more experienced players too. Occasionally cheesy rhythm programming. Some presets are too brightly voiced. Effects can be laid on a bit thick. 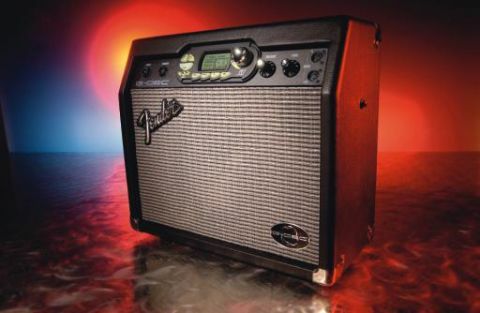 Practice amps have come a long way since the Fender Champ. Not necessarily in tone - a tweed Champ is up there with the best - but certainly when it comes to facilities. These days it's not unusual to see practice amps with built-in effects and even built-in digital recorders. It´s been left to Fender, however, to come up with what may be the most advanced practice amp yet seen - the G-DEC, or to give it its full name, the Guitar Digital Entertainment Centre. At its heart the G-DEC is a modest 15-watt modelling amplifier with an eight-inch speaker and single tone and volume knobs, but it has as much signal processing power as Fender´s Cyber Series amplifiers, endowing it with 17 different amp types, 29 effects and 10 reverbs, plus a built-in tuner. To get an instant sound, a large silver front panel dial calls up one of 50 ‘performance presets´. Each preset is not only a specific combination of amp sound and effects but it also has an associated drum loop and bassline in the style that the particular guitar sound relates to. Besides the factory presets there are also 50 user spaces to store your own guitar sounds, along with a drum and bass rhythm of choice. The drum and bass rhythms are switched to run by a single button press and can be quickly tweaked to suit the user - tempo and key being the immediately obvious choices. The actual sounds are generated by the G-DEC´s 16-part multitimbral MIDI sound module, which can be accessed by plugging a MIDI sequencer (hardware or computer-based) into the G-DEC and playing MIDI song files should you want a fuller sounding backing track or a song with complex chord changes to jam along to. A strap button on either side of the cabinet provides a useful method of carrying the G-DEC via the provided locking shoulder strap. The absence of a handle is because Fender wanted a flat surface on which the user could place a portable CD or mp3 player that could be plugged into the stereo aux input to provide another source of accompaniment. These can be used for simply playing along to, but the G-DEC has an internal phrase sampler so up to 14 seconds of music from any plugged-in source, including your guitar, can be recorded and looped. Half-speed playback is possible if there´s a difficult phrase that needs learning. Using the G-DEC is pretty intuitive. All of the illuminated front panel buttons are self explanatory and a large backlit screen lets you see exactly what´s going on if you want to start tweaking things. The factory presets should suit just about all guitar styles. There is something here for everyone, from clean country and reverb-soaked surf tones to full-on metal and Purple Haze-like fuzz. Some of the presets come across as quite brightly voiced, and the effects are sometimes laid on a bit thick - designed to impress by making a big sound emerge from such a small box. But on the whole, the tones are pretty good and absolutely fine for practice. The backing tracks are a real mixed bag. They certainly cover all musical styles but can vary from quite authentic sounding band backing to cheesy rinky-dink home keyboard territory. Nevertheless they are all a lot of fun and present a solid foundation to play along to. Most have just drums and bass but some have other instruments, like the nice smoky bar room piano touches in the Chicago Blues preset. In some instances you get a fixed bassline but in others it follows a set of chord changes, like in the various blues presets where you can jam along to an endless 12-bar. Some presets are designed to sound like a particular band, (you can easily figure out who from the cryptic preset names), while some have even cheekily nicked the bassline from a particular song: we noticed Immigrant Song, Billie Jean and Smoke On The Water in there among others. Generally, the guitar sound that comes with the preset is just right for the backing and encourages you to jam along. This is no bad thing as you can find yourself stretching your playing by accommodating musical styles - not to mention keys - you might normally cross the street to avoid. There are, however, plenty of parameters available for editing the guitar and effects sound to taste if desired. The G-DEC is a damn fine idea. Buy one to keep by the sofa for any time you want to plug in, tune up and jam with the ‘band´.